I found my Dragon Descendants! Not quite Chinese New Year yet but already we've tossed for prosperity. 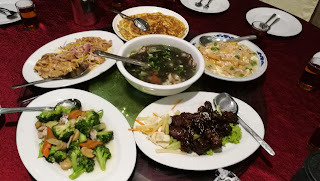 Just recently, I had had lunch with my other niece and her artist friends and many others in a Chinese restaurant. Lunch was simple; there were omelette, tofu seaweed soup and a few other meat and vegetable dishes. When we had all had our fill, my niece whipped out a red box. It was a pre-packed yee sang 魚生 which she had bought from the supermarket. Chinese normally enjoy this special dish which comprises thin slices of pickled vegetables and other ingredients on the seventh day of Chinese New Year. Chinese legend had it that the goddess Nu Wa 女娲spent six days creating animals out of mud, while on the seventh she created humans. It is on the seventh day of Chinese New Year then that yee sang is tossed to celebrate Ren Ri 人日, the Day of Humans. Happy Chinese New Year everyone and let's celebrate and embrace humanity! What's a simple life to you? To live in the wilderness and have a communion with nature? 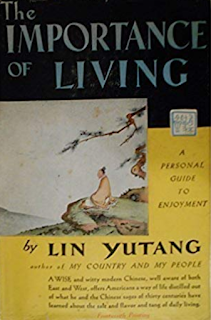 I remember Lin Yu Tang's 1937 acclaimed book, The Importance of Living 生活的藝術;Lin Yutang 林語堂 , a renowned and influential Hokkien Chinese writer wrote both in Chinese and English. He did not just compile and translate Chinese texts into English which became bestsellers in the West but several books he wrote including My Country and My People 吾國與吾民 and The Importance of Living 生活的 藝術 did sell well too and popularize Chinese philosophy and way of life. In The Importance of Living, he advocated a simple life as a way to enjoy life. That include taking walks, drinking tea, and having long talks with friends. With a smart phone in hand, we can do all three, I suppose. 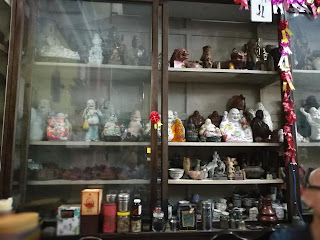 Just the other day, I was at an antique shop.The owner was hospitable and in a rather chatty mood. He flipped out his tea set, boiled some water and started to serve the guests Chinese tea. When he filled my cup, I automatically tapped my finger lightly, muttering, Thank you, Thank You! Qianlong, an emperor of China's Qing dynasty, visited southern China six times, each time disguised as a commoner. It must be in one of the trips that he poured tea for an accompanying servant. The latter, feeling honoured to be served by an emperor, would according to etiquette, kneel down to express his gratitude. However, he had merely tapped his fingers on the table for fear of giving away the emperor's identity. The bent fingers supposedly signify a bowing servant, one finger representing the head and the others the arms. 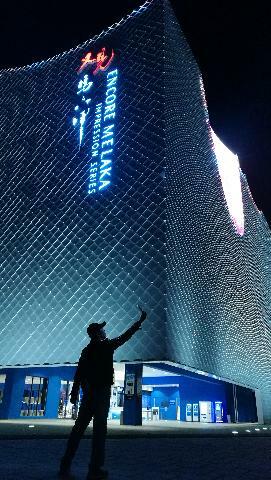 Light finger tapping has since become a customary way to thank someone who pours you tea especially in southern Chinese culture. 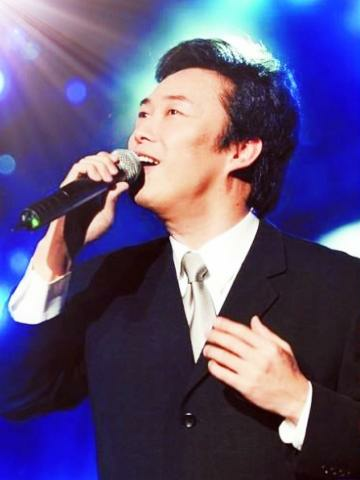 Fei Yu Ching 费玉清, Taiwan's famed singer is going to have a farewell concert for his fans. Fei Yu Ching probably comes from a singing family. Chang Fei 张菲, his eldest brother who presently appears in a variety programme in TV, Big Shot Fei Ge Show is a singer as is his sister, Jenny Fei who in 1991 became a buddhist nun and adopted the name Heng Shu 恒述法师. Don't know if his siblings have any popular songs in their belts but in the 80s when Taiwanese TV series was a yawn, there was this series where the theme song was sang by Fei Yu Ching. The song A sprig of Plum Blossoms 一剪梅, I suppose, has been popular to this day. His Good Night Song 晚安曲which ends the day's broadcast for China Television, to me pales by comparison but then one man's meat is another man's poison. Fei Yu Ching will be performing in Resorts World Genting, Pahang for two days it seems. I bet the concert wouldn't be complete without him belting out 一剪梅.